This is the first giveaway that I've ever held here on the blog. 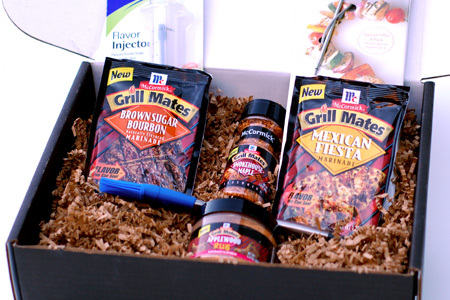 The good folks at McCormick Grill Mates® have offered up this pack of marinades, rubs and accessories for one fortunate reader. No entries will be accepted after 12 PM Mountain Time Friday, October 1, 2010. In the event that the winner cannot be contacted another winner will be chosen. Of course, shipping is on me. Important: Again, I must have a way to find your e-mail address. If it's not in the comment text I will look at your profile and your blog(s). If you don't see your comment posted within a few hours, it's because I couldn't find your e-mail address. I will contact you for your shipping information. Thanks to all of you who entered. I really appreciate your kind comments and encouragement. Matt and I like to see your recipes. We have tried a couple so far and have others tagged to try. Keep it up! You do a great job! This sounds like it would be yummy! What a great giveaway...and would love to try all of those products!!! Ooh fabulous! I love Grill Mates! Most of the McCormick stuff is very tasty. Would love to give this a try for the Winter BBQ season... BRRR. This would be great. It has some I haven't seen before. Important Note: I am getting a lot of entries that have no e-mail address available. If you don't see your comment posted within a few hours, it's because I couldn't find your e-mail address in your profile or on your blog(s). I can't contact you without an e-mail address. Entry, please! I got me a hankerin' for some smokin'. Love looking at the pics of your food! It all looks fabulous. Now I need to try some. I love McCormick Grill Mates! I grew up with my folks using the McCormick brands and therefore have been brand and customer loyal for most of my life, and now my family uses the products. We especially like (and go through lots) the chicken and steak seasonings which both add so much to our meats. I mix the steak seasoning in with hamburger before I make the patties, and they are so good! And John, not to forget you, I enjoy receiving your emails with fun, humor and great ideas for cooks and grillers! I'm all over this one. Got my fingers crossed! P Daddio, thanks for the give away for everyone to try for. I have enjoyed your blog, I check almost every day for new stuff. Soon as we get a free weekend, my guy and I might try out your gyros recipe. I enjoy your blog! Thank you for all the recipes and advise! I have really enjoyed seeing all the different ideas that you have done using the Grill Mates. I would love to try some of these products--especially the ones you used with the grilled vegetables! Do any of these seasonings contain MSG? I would be very interested in finding out that answer. Donna - The ingredients are listed at the product links above. I have not used the gift items before. I usually make my own rubs. Thank you for the opportunity to win! Love the recipes and tutorials. McCormick just keeps coming out with the best spice blends ever! I would be so happy if I were to win this gift pack. Love your blog and I love McCormicks! Thank you so much for all the fabulous recipes! Important Note: I am still getting a lot of entries that have no e-mail address available. If you don't see your comment posted within a few hours, it's because I couldn't find your e-mail address in your comment, profile, or on your blog(s). Awesome giveaway!!! We just built a new firepit in our backyard and we would LOVE to try some new grilling spices :0! Thanks for the giveaway :0! LOVE your Montreal rub. Have been using Mc Cormick for years. Your Applewood rub is great on PP. I use with applejuice concentrate injection. What a great prize to go with a great Blog. Thanks for all your great insight. Your grilled romaine recipe is still talked about by my family members after I made it for a 4th of July party. Dying to try the applewood rub! Great products, have used the rub in the past!